Aaron Griffiths at the head of the table, and Dr Clare Atkins, in black, left. A chance meeting in Second Life three years ago between Dr Clare Atkins (SL: Arwenna Stardust), of the Nelson-Marlborough Institute of Technology, and education-online tools developer and Second Life builder Aaron Griffiths (SL: Isa Goodman) came to a climax this week with a second runner-up place for the SLENZ Project in the prestigious, international EDUBLOG 2009 awards in the “best educational use of a virtual world” category. The New Zealand team won its second runner-up place in a competition which pitted it against 14 of the world’s best “virtual world” education organisations. 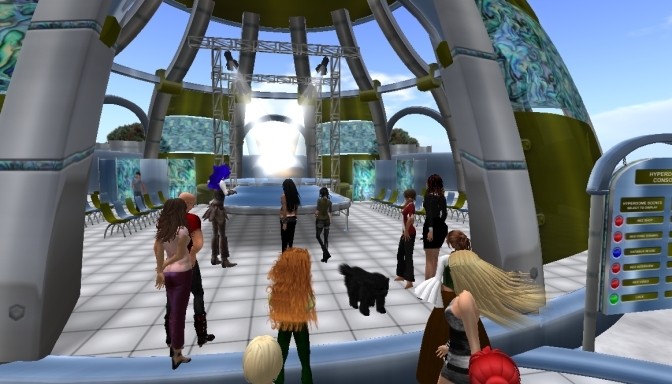 The winner of the title was Virtual Graduation at the University of Edinburgh; the first runner-up, Virtual Round Table Conference; with the SLENZ Project sharing second runner-up status with ISTE’s Second Life island. The EDUBLOG placings were chosen by public vote. The SLENZ Project creations – 2. The Kowhai Island arrival pad. “I don’t think either of us ever really imagined that only three years later we would have been part of a team that had not only helped to realise that dream but had succeeded beyond our wildest hopes,” Atkins said today commenting on the award to the NZ$500,00 project . It was designed to determine whether there were benefits from providing education in a virtual world and, if so, how those benefits could best be harnessed. “The SLENZ project has been a very large part of my ‘real’ and ‘second’ life for the last two years and I sincerely hope that its successes will enable us to continue the work that it has begun,” Atkins, who is joint co-leader of the project, said. 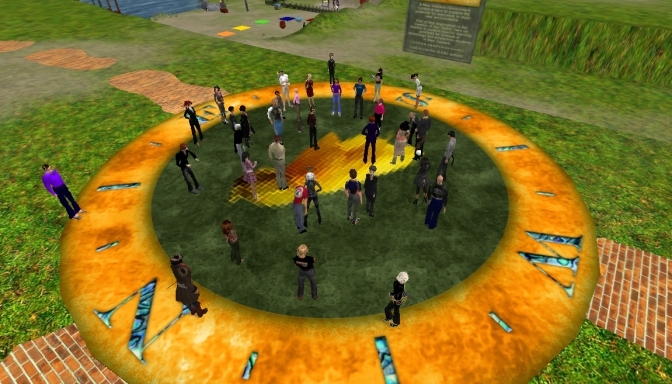 ” I think we have demonstrated, not only that the immersive and engaging experiences of multi-user virtual worlds have an enormous potential to enhance learning for all kinds and levels of tertiary students, but also that a small virtual team from New Zealand can create global-award winning experiences. 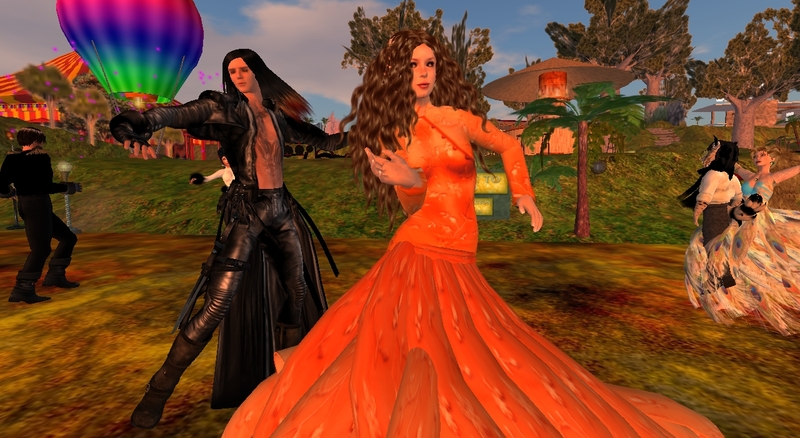 “Gaining this award is a recognition of the world-class work being done in Second Life by our educators, our designers and our developers and this is just the beginning,” she said. “I would like to thank those at the TEC who decided to take a bit of a gamble and fund the SLENZ project. “It was a brave decision to take in 2007 when education in this kind of environment was truly in its infancy but I believe that we have proved worthy of the trust that they displayed in us and that we have set the stage for some really exciting developments in the next few years. The use of environments such as Second Life will change the way we teach and learn in the 21st century and I hope we have helped to sketch out the early plans of how this might be achieved. Describing the award as “thrilling,” Project co-leader Terry Neal, of BlendedSolutions Ltd, said, “From the very beginning we wanted to share our journey so others could learn from what we could do well and what we could do better. I’m proud of what we have achieved, but its nice to know others value it too. “It has been a wonderful team effort. Each of us has contributed in a different way but no subset of the team could have achieved what the team has. I’m also proud that even though we are in such a small country we can still foot it with the rest of the globe when it comes to what is happening in virtual worlds. Aaron Griffths Second Life alter ego, Isa Goodman, “smiled and did a lil, happy dance” inside Second Life, on hearing the news, according to Griffiths, the SLENZ Project’s lead developer. Griffiths added, “This is a great achievement and I think all the team should be proud of what we have accomplished. 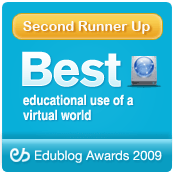 It is wonderful to have peer recognition that we have done something right in our attempt to explore the educational possibilities of virtual worlds and I hope that New Zealand will not now drop the ball as this award, I believe. recognises, we are up there with the best. “On a personal level I am very proud to have produced builds that have been received so well,” he said. “I believe it gives some credence to the methodologies used in them and in particular to the Foundation Studies build, which was deliberately designed to capture some of the elements of play that an environment like Second Life allows. 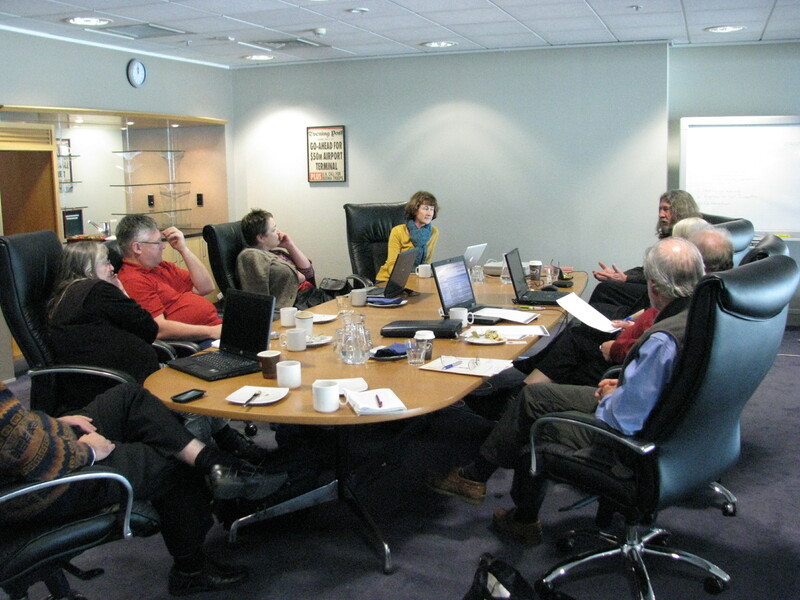 The core SLENZ team members who worked on the project, besides Neal, Atkins and Griffiths, included from time to time, Merle Lemon, Sarah Stewart, Todd Cochrane, Leigh Blackall, Ben Salt, Henry Work and John Waugh.